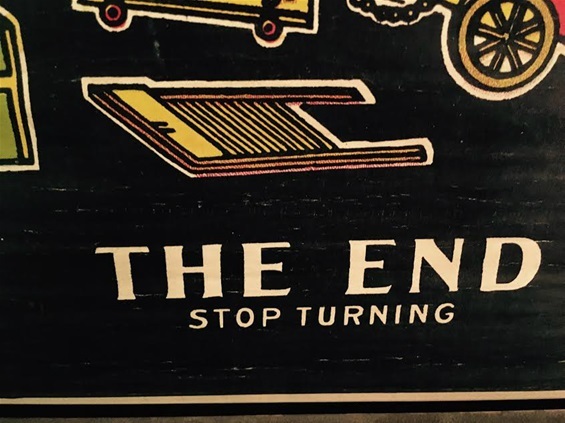 "Start Here" from the Lithoplate blackboard and scroll. 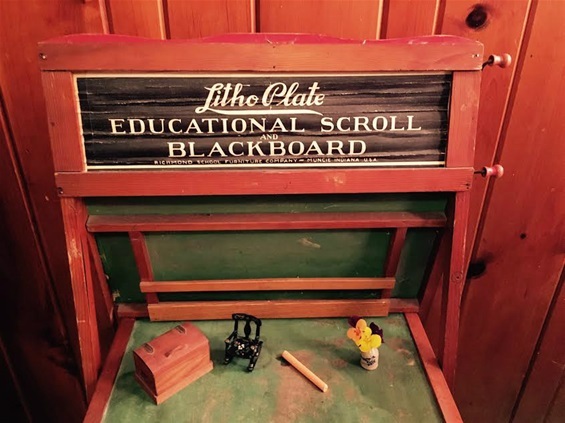 This page is a collection of 19th and early 20th Century scrolling boxes and blackboards used for education. - 21st Century, scrolling crankies are emerging in schools from the preschool through high school levels! Check out The Crankie Factory's page Made by Children. Number 29 is a Georgian House Museum in Dublin, Ireland. The video below shows what life was like in the late 1800s. At the very end of the video, when they are in the playroom, you will see the "Darton Scroll" on the wall. Used with the younger children, the Governess would turn the crank to reveal a new "lesson" every day. For more information on the Darton Scrolls, click on this link. Watch the video and take The Grand Tour! 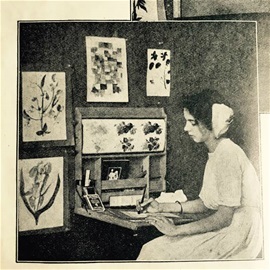 I purchased the Chautagua Writing Desk at a neighborhood estate sale. It was in mint condition, couldn't believe my luck. 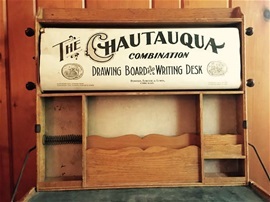 This writing table grew out of a whole educational movement that began in Chautaugua, New York in the late 19th Century. It focused on adult education as well as activities for young children at home. For more information about the writing desk, visit Alison King's website PixelPixie. "If you would avoid the paralysis of interest, beware of the toy that acts and does things itself, leaving the child merely to look helplessly on. If you would cultivate intense interest, select the tools and equipment that cause the child to think, to act, to construct, to do things, to plan things, to make things; in short, those which cause the child to become a creator. Initiative, invention, originality and self-discovery are among the rewards of wisely selected equipment in childhood." The scroll has over 30 scenes. It starts out with the basic alphabet and continues on with music notation, short hand, drawing, drafting and more. It ends with this beautiful painting of Lake Chautaugua in upper state New York. 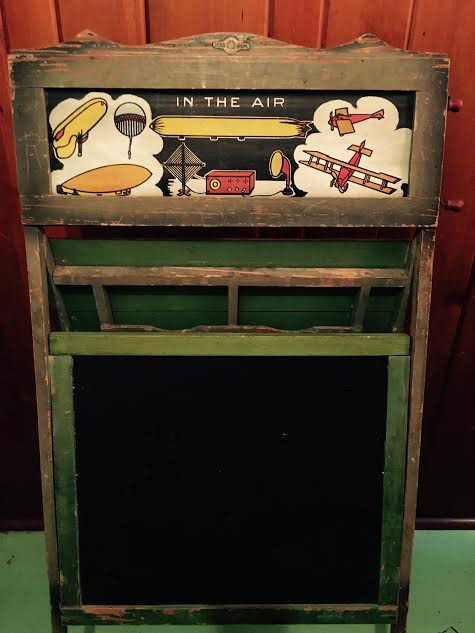 I bought this blackboard on an on-line auction. The copyright on the scroll says 1939. 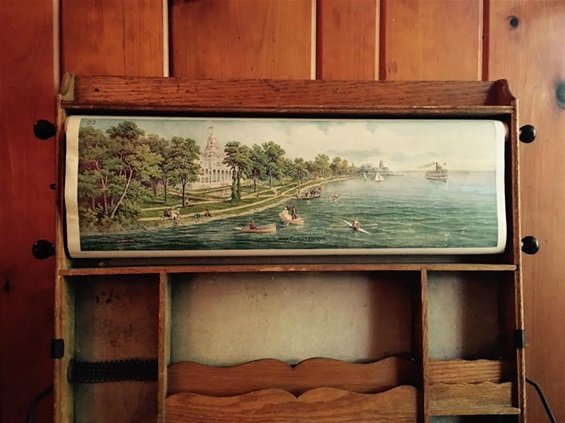 Made by the Richmond School Furniture Co. of Muncie, Indiana. An old advertisement states "Blackboard surface SLATED (not painted) with "LITHO-PLATE" - a ground slate preparation equal to natural slate, yet unbreakable." Here's a video so you can see the whole scroll. I purchased this at an antique store. 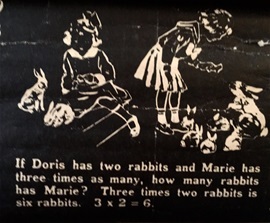 I haven't been able to find the year it was made. The person at the antique store thought it was WWII era. If anyone has any information, let me know! And that's it! 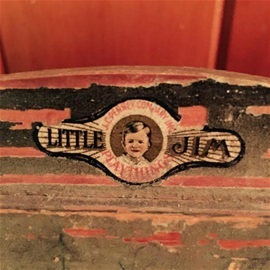 This photo is from the end of the "Little Jim" scrolling blackboard.